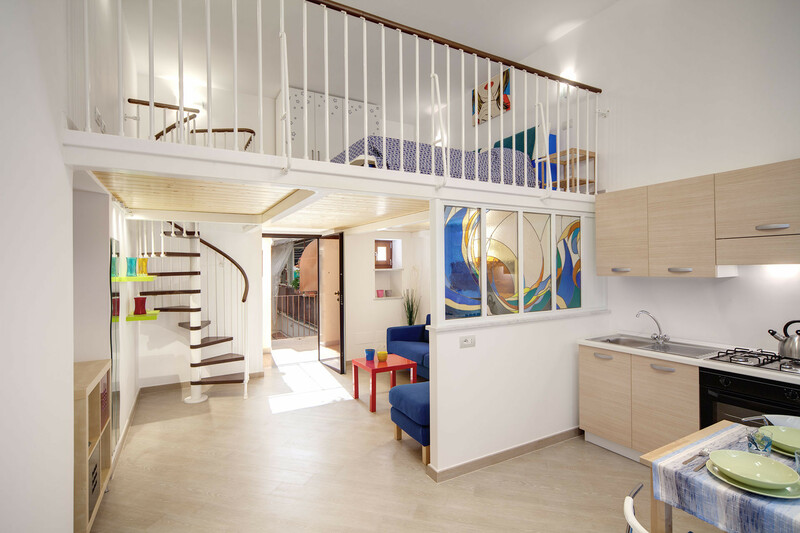 Gli Archi is a one-of-a -kind property with considerable charm, right in the historical centre of Sorrento. Spend a few hours wandering this section of town and you’ll know why Sorrento is such a popular destination. The old town is home to numerous historical buildings including the Basilica of Sant’Antonino and the complex of San Francesco. The quaint narrow streets are full of colourful shops and local restaurants serving fresh, authentic food. A wonderful place to discover the true essence of Sorrento. Set within this magical atmosphere is Gli Archi, or ‘The Arches’, on the first floor of an old building, reached via twenty low stairs. It is easy to see how the apartment was named, as it has double height ceilings permitting two mezzanine levels. You enter into a large living room with sofa, tables, flat screen 32” television and a stereo with a docking station. 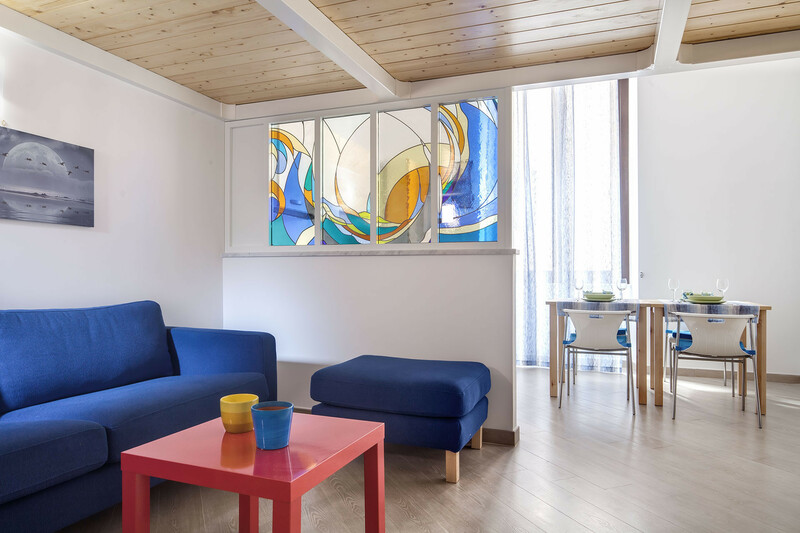 There is a low dividing wall leading into the kitchenette, beautifully decorated with a glasswork mural in blues and amber, depicting the sun rising over the waves. 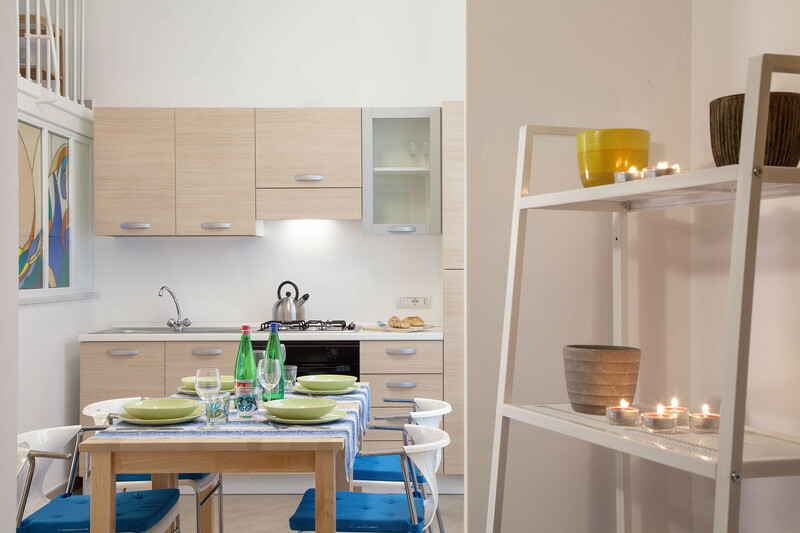 The kitchenette has fantastic high ceilings and a big window overlooking the streets below. 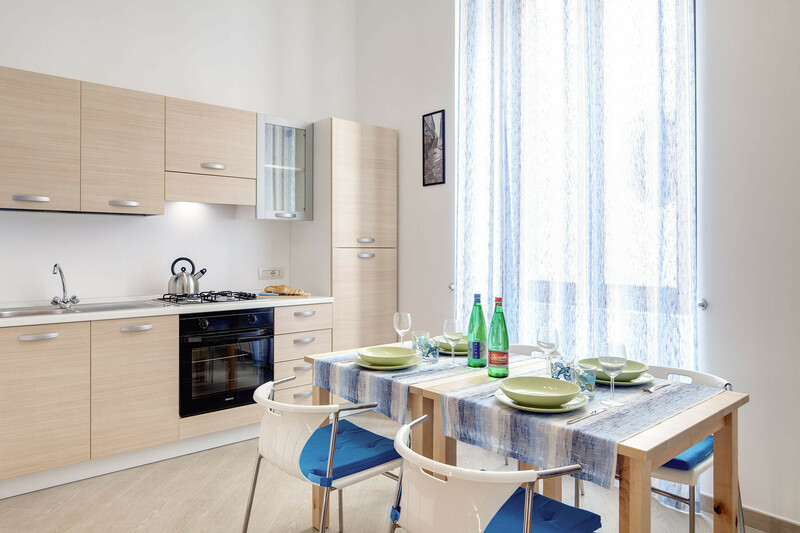 There are two small dining tables to seat four, plus all essentials including four gas rings, oven, fridge freezer, kettle, toaster and mocha coffee maker. There is also a washing machine, iron and ironing board in a separate room. There is internet Wifi throughout the apartment, plus air conditioning. At the other end of the living room is an elegant spiral staircase, leading to the first double bedroom. This overlooks the kitchen and has a queen sized double bed, armchairs and ample storage. Returning downstairs, a short hallway takes you to the bathroom and second double bedroom. 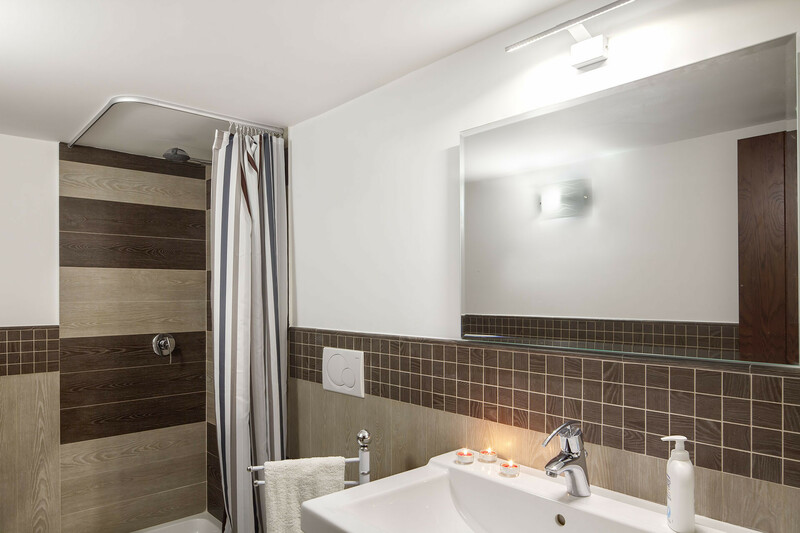 The bathroom is tastefully decorated in tones of mocha and latte and offers a shower enclosure, toilet, wash basin, bidet and hairdryer. 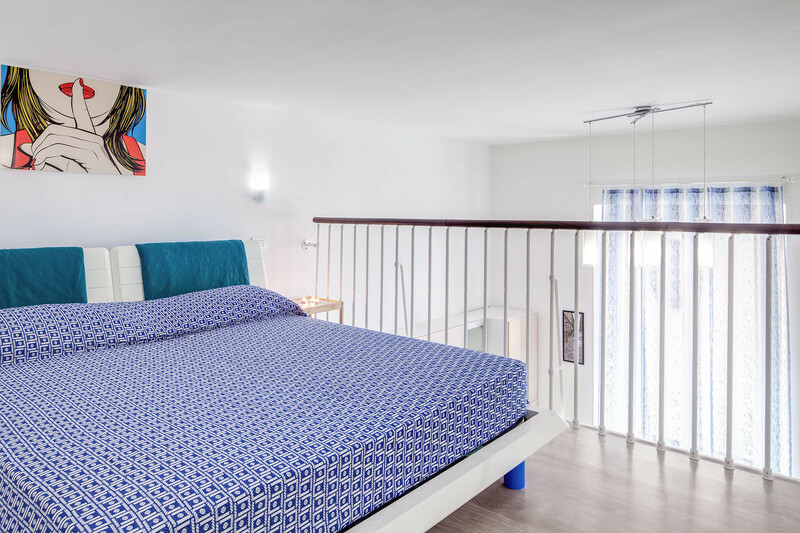 Entering the bright and airy second bedroom, you will see a comfortable double bed before you, with a second staircase leading to a seating area on a mezzanine level above. A car is not recommended for a stay at Gli Archi. Public transport links are very good and many attractions are within easy walking distance. Should you need to use a vehicle during your stay, there is nearby public parking. Once you’ve spent time exploring Sorrento, why not travel further afield. Gli Archi is a great base for travelling to the Island of Capri, or along the Amalfi Coast, with lush Amalfi, Positano and Ravello offering both beauty and cultural interest. TV, iron, internet (Wi-Fi), hair dryer, 70 m² property, single boiler on gas, air-conditioned. Guest on April 2018 - Clean and spacious flat for family! It was center of town, easy to get everywhere. Spacious, super clean. A little small shower booth and late night noise sometimes.